yeahimajerk wrote: I am at risk of getting flamed but I'm going to ask this anyway: Is there a problem with the aspect ratio on this disc? I recently found a used copy of Hard Boiled at a used book store for about $10. I checked out the disc and packaging and every seemed pretty legit. I’ve dealt with some Criterion bootleg’s in the past and this didn’t seem like one. So I bought it. When I got it home and played it I noticed the picture throughout looked like it was stuck in a small box in the middle of my screen. I use a PS3 as my Blu/DVD player and have a large flatscreen so it was very weird. I’ll try to post pictures later but to those out there who own the OOP disc was this how it always looked? Or did I somehow pick up a really good bootleg? It's not anamorphic (formatted for widescreen displays). None of Criterion's early discs were. You can set your TV to "zoom" mode for this disc. It's not going to look great. The Criterion disc wasn't anamorphically enchanced so the picture will be heavily pictureboxed on all four sides on a widescreen display. It seems that back in the day Criterion were a bit slow on latching onto the now standard policy of enhancing widescreen films for widescreen displays and as a result many of their older releases look extremely dated for this reason. Ok, good to know fellas. Thanks for helping me out. I also noticed that there was no Criterion logo that ran before the disc started. It just went right into the logo for the distributor. Were some of the early disc's like that, also? I have some early discs - Silence of the Lambs - and even those disc's have the old Criterion eye logo. I know Hard Boiled didn't have the logo, and I think The Killer was the same way as well. I'd have to pop it in again to check it out. I don't recall any other early ones where the logo doesn't appear. As a note, Insomnia was Criterion's first anamorphic release, but even after that not every title was anamorpic. All of the Handmade Films titles, except Life of Brian, were also non-anamorphic, along with the first printings of Charade, Brazil, and a few others. I saw Hard Boiled last night on an old 35mm print, and something seemed off to me while I was watching. When I got home it dawned on me that the print's subtitles refered to Tony Leung's character as "Tony" and not "Alan", as it should be. Has anyone else seen a version like this? I guess we're in the same town as I saw the print the following day on the 10th. I sat next to someone who was fluent in Cantonese with a friend and said that to them after that the subtitles were fairly accurate outside some additional swearing which is not in the original. As for the name, I've never seen a home video copy with that name attached to it. Might have been just a way to have more characters play characters named after the actor. (Teresa Mo as Teresa Chang, Hoi-San Kwan as Mr. Hoi, John Woo as Mr. Woo). The only other things I recall that I don't remember in any other screening is that before the credits scroll, some text dedicating the film to screenwriter Barry Wong, who died during production. In the last month, I have gone through dozens of pre-1997 handover Hong Kong films, mostly action with a few comedies in the mix. A lot of these films ranged from excellent to uneven curiosities. One of the highlights was rewatching both of these films on my CAV Criterion laserdisc editions on a tube TV; a blast in the past to my early cinephilia days. I kept hearing how awful the Weinstein Blu-rays of these are and I personally think the laserdiscs still look great, so why upgrade when I have perfectly find editions already? I seriously hope the Weinstein's have lost the rights to this like they might have with Police Story, but I don't see Criterion interested in these types of films anymore. But watching these among all the other Hong Kong films, it's so clear to see how John Woo ended up having the career he had in Hollywood. In comparison to other "heroic bloodshed" or action films of the era, Woo's films are outright masterful. The way he plays with editing as he breaks the rules of classically good editing to obliquely repeat cuts from multiple angles to emphasize certain actions is still a skill missing in Hollywood today. The way shots gives you the full impact of the bullets tearing through bodies with that slow-motion Peckinpah touch makes the violence feel so much more impactful than the sequences of mass violence framed poorly in recent films like Kingsmen which have no understanding of cinematic space and power. And the pathos of Woo's cinema still works. It's as over-the-top as Hong Kong ever gets as big emotions are punctuated with large explosions and barrages of bullets. I know Woo is a big fan of Douglas Sirk (another favorite of mine) and never caught on the visual impact his Technicolor features must've had. The sequences at night use color in such abstract, gorgeous ways that makes scenes of drama as wild as the gun fights. Re-watching The Killer, I don't think action cinema has ever gotten better than the chunk of the film from the boat assassination to the chase in the hospital. The last new Woo film I saw was Red Cliff which thudded along like a Hollywood epic with enjoyable moments, but nowhere near the exhilaration and thrill of his earlier work. Hong Kong stunt work from the 80s and 90s felt so dangerous in a way movies haven't replicated since the silent era. Sets are far safer with CGI and increased budgets so you don't have the threat of death or injury anymore (didn't a stunt person die from the shanty town car chase in Police Story? ), but you really miss the thrill and fun of this era of cinema. It feels like each film at least has one moment that you'd never see in any film from any other period of time. One of the unfortunate things is that here in Los Angeles, getting official, factory pressed Hong Kong films was easy in my younger days, but now that I have the bug and want to watch more, I find it increasingly difficult to find DVDs of these films. Previously, the legendary Five Star Laser had every single Hong Kong DVD I could've wanted (including Japanese films with English subtitles), but the only places I find films are in the swap meets/markets which are all clearly bootlegs. When I go thrift store shopping, I always check the movies section as you'll occasionally find a Hong Kong rarity that's often worth the blind buy cost of $2 or $3. And it's absolutely worth looking through the VHS or Laserdiscs for long out-of-print titles that never made it to DVD that history's forgotten about. Just saw a Facebook post and found that the theme song of The Killer in the Criterion DVD is not the original song played in the theatrical version. The poster even showed a clip from the Hong Kong laser disc that has the original song intact. Since both songs are sung by Sally Yeh who was with Warner Music at the time, can't imagine it was replaced due to right issues. Do you have a link? This is the song that I always have the opening placed with, but she does sing a few different songs in the film. It's also the Sally Yeh song Jia Zhangke references again and again in his films. Here is a link to the Facebook Page. If the link does not work, try search Facebook with 威哥會館. The clip is on the top of the video list. The song in your link is 淺醉一生 (Cian Zhui Yi Sheng), which is the song in the Criterion DVD. The song 隨緣 (Sui Yuan) only appears as the end theme for the Criterion version (at least, the LD). 淺醉一生 (Cian Zhui Yi Sheng) appears as the song just after the opening credits and the song in the cassette deck (the Facebook clip) on the same LD. What I did pick up from the Facebook clip is that the source was an LD as well, but the title on the jacket was written using simplified Chinese characters (喋血双雄). The title in the Criterion LD uses traditional Chinese characters (喋血雙雄). May this suggest that that version has a Mandarin soundtrack (Taiwanese relase but not necessarily the longer version originally released there) rather than a Cantonese soundtrack (Hong Kong and international release)? The 双 was used in some of the marketing as a stylistic choice—see for example this poster, which is otherwise entirely in traditional characters. 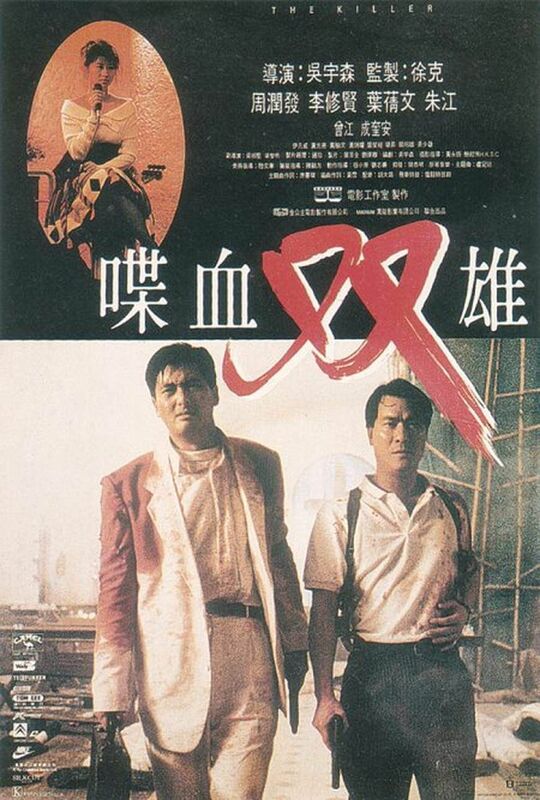 As for the possibility that the clip is from a Mandarin version, I don't own a copy of the film with the Mandarin dub, but there is one floating around online and it uses 淺醉一生 for this scene (the Cantonese version, even though Yeh also recorded it in Mandarin; it's not unusual for Mandarin dubs of HK films to retain the Cantonese songs). But the version I found is clearly a remix, so this doesn't necessarily tell us what was on the original. In fact I don't think the original Mandarin mono mix has ever been released on DVD, unless you count the Taiwanese release which is a different cut altogether. It should perhaps be noted here that the Criterion LD was transferred from a release print (!) supplied by the Hong Kong distributor—presumably a made-for-export print, since it didn't have Chinese subs. Even that's a bit bizarre at the Criterion laserdisc has the credits open with Chinese and English characters and a very full set of credits of who worked on the film. I just recently watched it off a European DVD that has these large, garish English-only creidts that just credit the major stars and cast, not the full crew. The Facebook poster is from Hong Kong so I strongly believe it is a Hong Kong LD. He is also a Cantonese speaker so I am pretty sure he had the Cantonese track on. A few more follow up comments on that post also mentioned that the HK theatrical release did played 隨緣 (Sui Yuan) but the song was switched in subsequent HK home video releases. However, it is a valid point that the home video releases maybe sourced from a Taiwanese release. Anyway, let me ask if he ever listened to the Mandarin track on the LD (provided it has one) and if 淺醉一生 (Cian Zhui Yi Sheng) appears. Or as Teh Fanciful Norwegian mentioned, is it possible that the song was switched when preparing the longer Taiwanese cut? The more knowledgeable members here have filled in a few more gaps, and I did wonder why I had never seen any poster that didn't use 双 for shuang rather than the 雙 that appeared in the opening credits of the Criterion LD. The LD database also lists no other Chinese release on disc, so this appears to be the only one that features a Mandarin language track in any way. I used to hear that the longer cut released in Taiwan in Mandarin was in fact released in theater(s) before the film even got its first screenings in Hong Kong in the 110m version. But I understood that this longer version was only released on home video on VHS. A French DVD release has a 124m (PAL) cut advertised as the uncut Taiwanese release as well but there are differences.